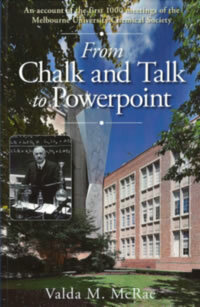 The story of four decades in the School, Chemistry@Melbourne, and an account of the first 1000 meetings of MUCS From Chalk and Talk to Powerpoint, written by Dr Valda McRae. 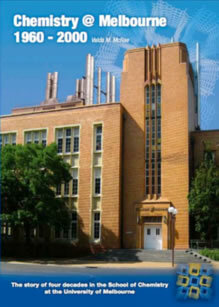 The story of four decades in the School of Chemistry at the University of Melbourne. To purchase a copy of the book please fill in the order form and send it via email to Ms Liz Mills: emills@unimelb.edu.au. An account of the first 1000 meetings of the Melbourne University Chemical Society.